Old Man Emu springs are the original high performance heavy duty springs available in North America. They are by far the most popular aftermarket suspension for Land Rover applications, and for good reason – great quality and great value. OME supplies several different settings for numerous applications, so selecting the correct springs for your vehicle is critical to get the results you want. Rated lift is 1.5 inches. 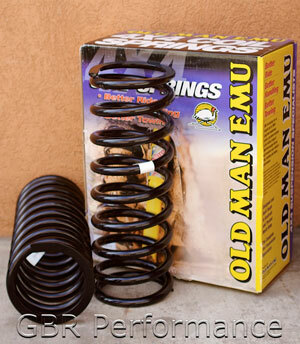 OLD MAN EMU Springs (OME) are without a doubt the most popular aftermarket coil springs in North America. They are manufactured in Australia and designed for the harsh conditions found in the Land Down Under. As a result they are very high quality and hence very durable. We carry a full line of them and have been distributing them since 1995. We run them on our own vehicles. As a result we know this product line. We feel it is important to purchase them from a company, such as ourselves, that has a lot of experience with them to optimize your satisfaction. This is important because a single part number can be recommended for several different applications and knowing the subtle differences between applications is important. Also terms such as medium duty and heavy duty have a slightly different meaning in Australia compared to North America. The biggest problem we see in the Land Rover market is customers being sold too much spring for their application resulting in an unnecessarily harsh ride quality. Als,o any time you modify an existing suspension, there can be unintended side effects such as loss of castor and driveshaft geometry issues. We can explain these before you purchase and the likelihood of these issues so you can get a complete picture of your total potential cost. We can also supply the products such castor correction kits and custom driveshafts to eliminate these problems. Australia is a right hand drive country and follows Land Rovers tradition of sided springs (drivers side vs passenger side). We feel that sided springs have no benefit for a left hand drive Land Rover so we match all of our OME springs as either all drivers side or all passenger side. They differ in free height by 10 mm. Failure to do so can result in a vehicle that does not sit level. We were the first OME distributor that offered matched OME springs. If you are interested in how the tradition of sided springs originated, give us a call for the story. We are also the exclusive distributor the genuine OME 3 inch lift for the RRC, Discovery 1 and Defender 90’s with a Discovery 2 in development. This is not a kit that mixes and matches front and rear springs including some from non Land Rover applications in combination with spring seat spacers. At our request, OME designed, tested and developed this suspension kit for us. It includes custom valved and extended shock absorbers. See our section under suspension kits for a full description. We work closely with RoverTym engineering and are the stocking distributor for their 2″ coil springs. 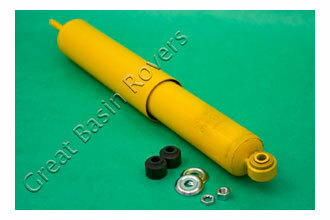 We are very knowledgeable about their suspension and can supply them along with making shock absorber recommendations. 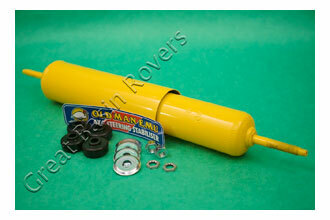 Still the Best.We are the oldest Land Rover specific Bilstein supplier in the USA. Our knowledge of them is unparalled in North America. We have the most comprehensive selection including many applications not normally supplied in the USA. We also maintain a large inventory so we can supply them immediately. We are not an internet drop ship business. We can meet or beat any advertised price for Bilstein shocks and can provide Bilstein shocks for any non Rover vehicle application as well. 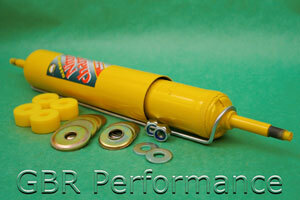 We supply 7100 shocks with poly-urethane bushing. This is because they are much more suitable for general off road/street use compared to heim joints. We can supply heim jointed shocks upon request. We can also supply 7100 shocks in either longer or shorter lenghts. All of the listed part numbers are short body/remote reservoir applications. We can supply non remote reservoirs upon request – please inquire. Bilstein GmbH was estalished in 1873 in Ennepetal, Germany. They invented the gas pressure shock absorber in 1953. They developed and perfected what is known as a high pressure gas monotube design. A monotube design is far superior to conventional twin tube shock absorbers. Bilstein shock absorbers are used on many of Europes highest performance sports and touring cars including Mercedes Benz, BMW, Porsche and Ferrari as either original equipment or optional upgraded suspensions. In 1984 Bilstein and General Motors started an association that has culminated in Bilsteins being offered on 33 separate GM models. They are original equipment on all Corvette models including the computer controled electronic ride system (ERS) originaly introduced on the ZR1. Bilstein also has an unparalled record of motorsports sucess including Formula 1, NASCAR and SCORE/HDRA off road events. They were first used in North America in 1970 in the Baja 1000, which they won. Bilsteins almost instantly dominated this class of racing which continues to this day. The same can be said NASCAR. They were introduced in the early 1980s, within one season 98% of the field were using them and continues to do so. We have been proud distributors of Bilstein shocks for over 20 years and were the original U.S. importers for Land Rover applications. We can also provide Bilstein shocks for any other vehicle, including non standard applications such as long travel suspensions,custom valving and remote resevoirs. 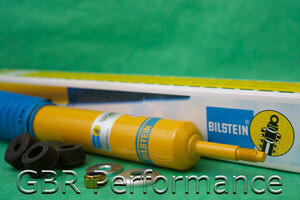 Call us for all of your Bilstein shock needs. 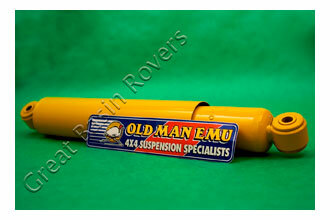 Old Man Emu Nitrocharger shock absorbers are built and designed in Australia for Australian conditions. Invariably, vehicles are heavily loaded, fitted with accessories and driven on harsh Outback roads for prolonged periods. This is because Australia is the most sparsely populated continent in the world, hence the need to heavily load, fit lots of accessories and drive long distances! This is the crucible in which Old Man Emu suspension components are designed for and tested in. Old Man Emu engineers specialize in nothing else but 4WD suspension systems so they are the most experienced group of 4WD suspension engineers anywhere. When developing shock absorbers Old Man Emu takes all of these factors into consideration. This is reflected in the superb structural integrity of Nitrocharger shocks along with the fact they are properly valved for the conditions they will be required to work under. In addition, they are valved with the idea in mind of preserving the excellent on road ride quality usually found on modern 4 wheel drive vehicles. Old Man Emu shock absorbers in many cases, several shock absorber applications are listed for one vehicle to ensure the proper match regardless of spring selection, installed accessories or load carrying requirements. 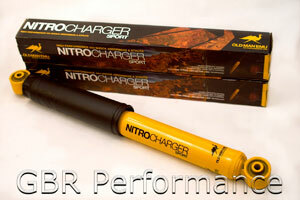 We have been selling, installing and using OME Nitrocharger shock absorbers on our own vehicles since 1992. We are one of the oldest and most experienced Land Rover specific Old Man Emu vendors in the USA. We can offer you technical knowledge in addition to friendly service and competitive pricing. Heavy Gauge Reserve Tube – .06 inch, the heaviest on the market and vital for protecting the vital interior components from damage. Supplemental Welds on both top and bottom for added strength. 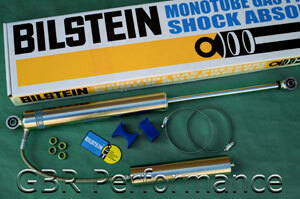 We carry both OME and Bilstein steering dampers including some models not normally available in North America. Off road vehicles are very individualistic, so frequently off the shelf suspensions need to be customized to exactly fit your needs. We carry a large selection of products, including our GBR line of spring spacers. 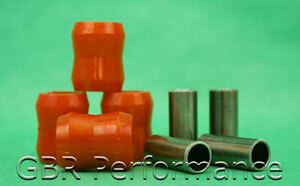 We offer a selection of spacers for various models of Land Rovers. First a few words on spacers. In our opinion, the function of spacers is frequently mis-understood. They are frequently sold as an inexpensive lift kit with some vendors offering them in sizes sometimes in excess of 2 inches. We have seen them used for up to 4 inches of lift by do it yourselfers – scary! We feel this is an inappropriate use of them. We feel they should be used only as very moderate lift kits or to trim the vehicle due to circumstances unique to that vehicle. By trim we mean to raise either one side of the vehicle or the other or to raise one end of the vehicle or the other. So, you ask, why shouldn’t you use them as moderate to large lift as compared to springs and shocks? The major reason is that when you lift a vehicle you also raise the center of gravity. Suspension engineers know this so when designing a lifted suspension that is meant for some street use, they usually increase the spring rate and modify the shock absorber valving to compensate for this fact. Failure to do this can result in an ill handling and even a dangerous vehicle. An example is that a vehicle with a higher center of gravity will experience increased body roll. This is why we offer our spacers in ½ and one inch only. Our spacers are anodized aluminum and come with all of the appropriate hardware. Isolator’s have another function, which is to isolate the suspension of the vehicle from the body. Your Land Rover already has several means to isolate the suspension from the body, which are all of your suspension bushings. Spring isolater’s are just an additional means to do so. They can also be used to trim the vehicle slightly (1/4 inch) so you can get the benefit of both.